THE SECRET TO GRILLING LIKE A PRO! Are you tired of LOSING YOUR FOOD TO THE GRILL? Its FRUSTRATING! Tugging at that perfectly marinated chicken breast that sits ruined and stuck to your grill. How about the spears of asparagus falling through the cracks? NEVER AGAIN! THE FUTURE OF GRILLING IS HERE! 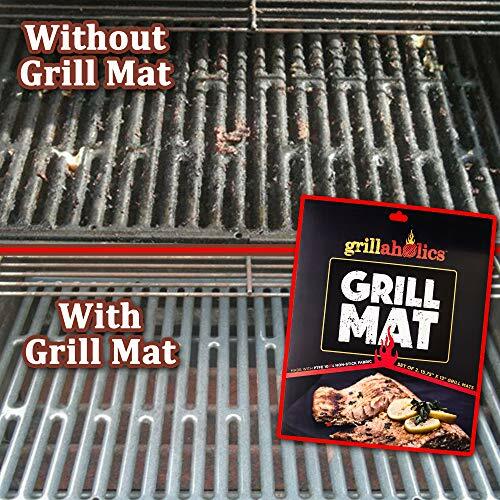 INTRODUCING THE GRILLAHOLICS GRILL MAT - THE ULTIMATE GRILL MAT FOR YOUR NEXT BBQ! 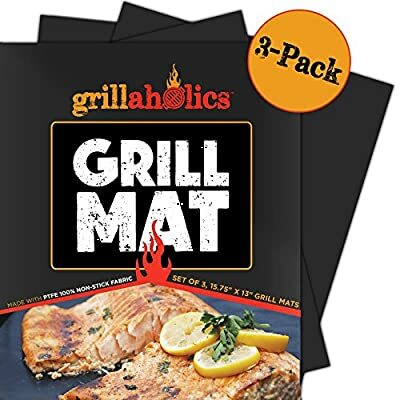 - Set of three 15.75" x 13" mats made from heavy duty PTFE (PFOA Free) coated fabric that makes grilling a dream! - Keeps your food from falling between the grates and allows for evenly grilled food every time! You can even see the grill marks on your food! - Perfect for chicken, wings, ribs, burgers, steaks, fish, shrimp, fruits, vegetables, breakfast, and even pizza! - Can be placed on top of any grilling space (charcoal, gas, or electric) and recommended with temperatures up to 500 F! - 100% non-stick and dishwasher safe...use it OVER and OVER AGAIN! No more ruined dinners and clean-up is a breeze! The Grillaholics Grill Mat will change the way you grill! We love our product and so will you! 100% Customer Satisfaction, GUARANTEED! With our Lifetime Guarantee, if you are not completely satisfied with your Grillaholics Grill Mat, let us know and we will make it right! BONUS GIFT?!? Grillaholics is more than a brand, it's a community! When you order your Grillaholics Grill Mat you will receive a claim for a FREE VIP members-only Grillaholics wristband that proves you are a true Grillaholic! 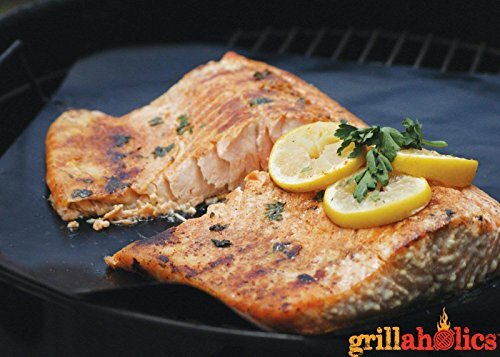 You also receive Grillaholics Top 10 Favorites on Amazon Guide. GRILL LIKE A PRO AT YOUR NEXT BBQ! ORDER NOW and become the GRILL MASTER you've always wanted to be! PERFECT - Thicker does not mean better. We tested multiple thicknesses before developing our mats. Our grill mat is thin enough to leave grill marks and flavor intact, yet thick enough to provide ultimate heat resistance and durability. With our Lifetime Replacement Guarantee, 3 mats is all you'll ever need. NEVER buy another grill mat again! MULTIPURPOSE - Our cooking mat works with any kind of barbecue grill - Weber, Charbroil, Big Green Egg, smoker, charcoal, propane, gas, or electric. Better than any grill pan or basket, our mat can be cut to any size or shape to fit any need. Also doubles as a bake mat! NO MESS - Never BBQ on a nasty, dirty grill grate AGAIN! Keeps your food from falling between the grates or sticking to the grill! In no time, you'll be grilling like a pro. Reusable and dishwasher safe makes cleanup a breeze! BONUS GIFT - An exclusive VIP members-only Grillaholics wristband ($5 value) and Grillaholics Top 10 Favorites on Amazon Guide. Important Note: Only available when purchased from Grillaholics. LIFETIME GUARANTEE - Best value in bbq grill accessories! If you're not completely satisfied, we'll make it right or your money back. Why wait? Try yours RISK FREE before we sell out! Consider getting TWO - one for you and one for your very best friend! Purchase 3 or more and get FREE shipping.